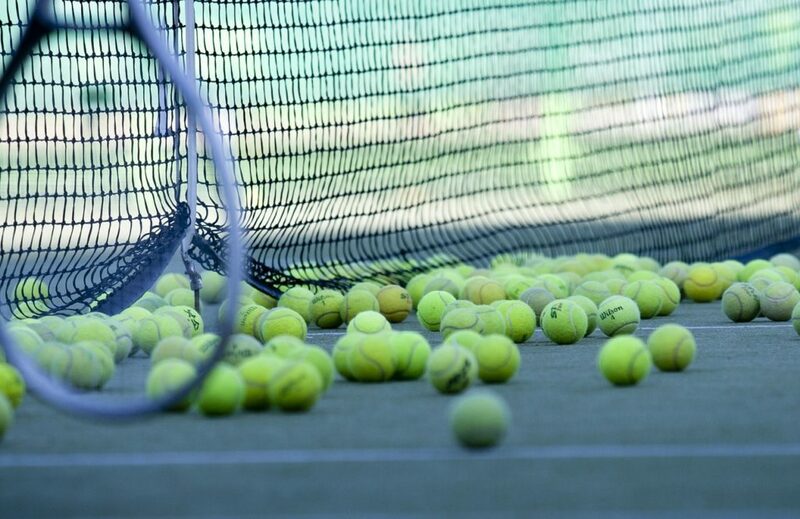 In this tutorial, we’ll show you 10 awesome tennis drills to improve your coordination, strokeplay, reflexes, and movement on the court. The first 5 are meant specifically for beginners, while the final 5 are designed specifically for kids. However, you can mix and match – feel free get older kids practicing with our beginner drills if you like. A partner or a tennis ball machine to fire balls at you. If you’re coaching a junior player, you’ll be their partner when practising. Alternatively, if you’re by yourself you can also use a wall to rebound balls back at you. Lots of tennis balls. If you’ve only got 6-12 balls you might find yourself picking them up every 5 minutes or so with a few these drills. It’s definitely worth buying a bulk bucket of 48 or more balls if you can. As a new tennis player, you’ll want to focus on the basics – learning how to play forehand and backhand strokes, making legal returns, and moving to meet the ball. Will I need a partner or a ball machine? No. Trains: basic racquet movement, hand to eye coordination. Keeping the ball in the air by hitting it repeatedly with your tennis racquet isn’t that difficult. 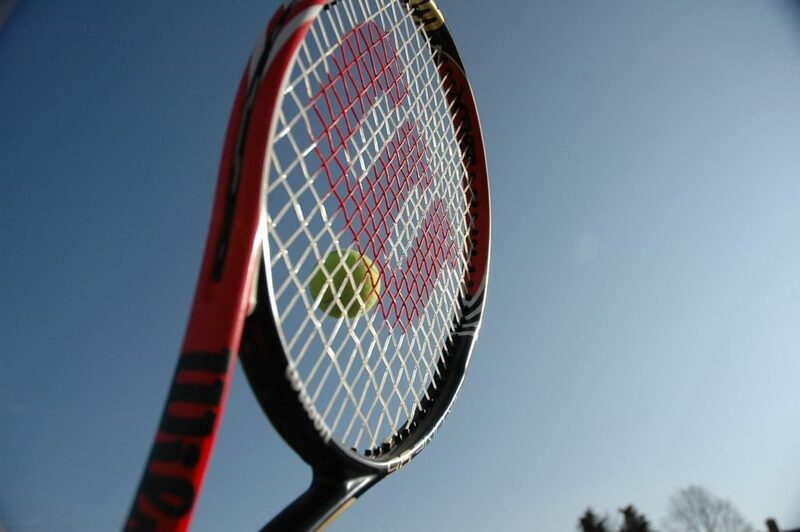 However, it becomes a little bit more challenging if you alternate between the two sides of your racquet with each hit. Twist your wrist to use the other side of the string bed. Try and see how many hits you can do in a row without losing control of the ball. Once you get to 20-30 hits, you can be sure that your coordination is good enough to begin practicing proper shots. Will I need a partner or a ball machine? Yes. Trains: aim, reflexes, court movement. Layout three large bins or buckets on one half of the court on the service line – one in the middle, one on the left, and one on the right. Have your partner stand behind the middle target. You should stand on the other side of the court. Your partner should feed in soft lobs that bounce right in front of you. As the ball crosses the net, have them shout “left”, “right”, or “center”. Your job is to get the ball into the corresponding target, or at least hit the outside of the target. Once you play a shot, your partner should immediately feed another ball into you. It’s OK if your partner lands the ball a bit to your left or right, this will improve your movement on the court. Just make sure that the shots are soft and fairly easy to hit. If you get really good at this drill, you can tell your partner to shout whether to play a forehand or backhand, as well as the bucket to hit. For example: “left, forehand”. This is a simpler version of the above drill for those who don’t have a partner or a tennis ball machine. Find a nice solid brick wall you can play in front of. Using chalk or tape, mark a line parallel to the ground that’s 3.5 feet from the floor. Now, mark lines perpendicular to the floor going up from the parallel line 27′ apart from each other. This is your net. It’s a bit narrower than the real deal, because we want to make it the width of a singles court. To begin with, stand around 25′ back from the wall and practice basic rallies. If the ball touches below the horizontal line or wide of the vertical lines, start again. Once you reach 20 consecutive shots in a single rally, you can begin to make the game a little harder. Make three 1′ by 1′ square boxes at the same height – around 1′ above the horizontal net line. Put one in the center, one 6′ from the left edge, and one 6′ from the right edge. These are your targets. Practice rallies again, but aim for one of the boxes every so often. Don’t focus on power too much just yet – that can come after you learn to shoot accurately on a consistent basis. For beginner players, learning how to return the ball legally should only take a session or two. What you’ll struggle with is doing it under match conditions: when you don’t have much time to react and when there’s pressure on you to make the shot (if you’re playing competitively). To practice this, stand in the middle of the baseline with your back to the net. Position your partner (or tennis ball machine) in the other half of the court. Their job is to play a fairly soft shot somewhere random in your half of the court, in a place where it’s possible for you to reach it. As soon as you hear them play the ball, you have to turn around, sprint to the ball, and make the return. If there’s a lot of noise at the court, have them call out as they hit the ball. Adjust the difficulty of the shots based on how well you’re able to return them. If you like, you can continue to play the rest of the point against your partner. Practicing your serve can be a little boring. To spice things up, place an empty tennis ball can just inside one of the back corners of the service square. Keep a bucket of balls with you on the baseline, and keep firing away until you hit the can. This should prove to be a real workout, especially if you struggle to hit it. Here are some other targets you can use. We’ve ordered them from the easiest to the hardest to hit – if you’ve just started playing tennis, use something from the top of the list. Just make sure that you’re able to tell when you’ve hit the target! This way, you’ll have the satisfaction of knowing your serve is improving. For junior players, fun should be the aim of the game. Kids can get bored easily, so it’s important to use interesting drills to keep their attention. Trains: hand to eye coordination, court movement. Position a bucket at either end of the baseline, and have the player(s) stand in between them. Each kid holds a racquet in each hand. Stand on the other side of the court and play soft underarm shots that bounce just before the line. The child’s job is to pick up the balls and collect them in their bucket. They must grab the ball in between their two racquets – sandwiching the ball to hold it, like they’ve got crab pincers. Picking the ball up when it’s on the ground isn’t allowed. To make things more interesting, have a competition between two or three kids and see who can collect the most balls in their bucket. Alternatively, use two different colors of balls – yellows must go in one bucket and reds in the other. 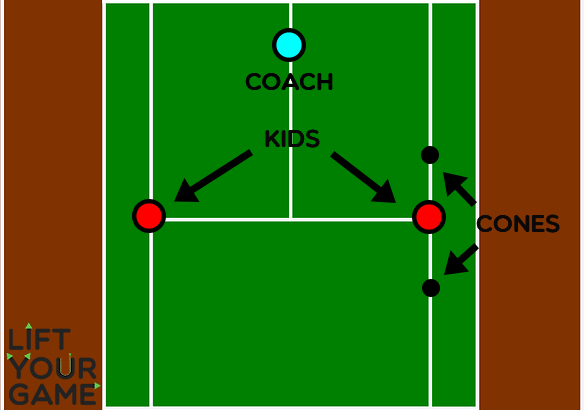 This forces the player to think about where they’re going to be running after collecting each ball, which allows for the development of more complex positional strategies further down the line. This is another fun drill that’s perfect for groups of three to twelve kids. Simply give them a racquet and a ball each, and have them do relay races up and down the court (use cones to mark out each team or individual’s lanes). Once a player returns to base, the next player in their group goes. The team who completes the necessary number of laps first wins. Have each player either juggle the ball (keeping it in the air by hitting it with their racquet) or dribble the ball (hitting it against the ground with their racquet, as if they were playing basketball). This is great for coaching hand to eye coordination, but it also forces the player to focus on both the ball and their movement at the same time, which is what they’ll need to do in actual matches. Trains: hand to eye coordination, forehand and backhand, reflexes. Teaching kids the basic forehand and backhand technique without resorting to a boring drill can be a little tricky. To keep junior players interested, get your kids into pairs and set up a penalty shootout scenario, soccer style. Put the “shooter” on one side of the court and the “goalkeeper” on the other, in between two cones/markers about 10-12′ apart. The goalkeeper starts with a tennis ball in their right hand and a tennis racquet in their left. They must throw the ball to the shooter (ideally having it only bounce once) who then plays a forehand shot towards the goal. The player in the goal can then block the shot using their racquet. But if it goes in the goal (and doesn’t go too high), the shooter gets a point. Once they’ve got the hang of forehand shots, switch over to backhands. NOTE: safety is an issue when having kids hit balls at each other. Even if you’re coaching really young kids, keep them a good distance apart. This gives the goalkeeper time to react to the ball and put their racquet in the way. If you need to make it easier for the shooter, simply make the goal wider. If having the goalkeeper throw the ball doesn’t work, you can always move to behind the goal and throw it yourself. Just make sure the keeper is ready to play before you begin! 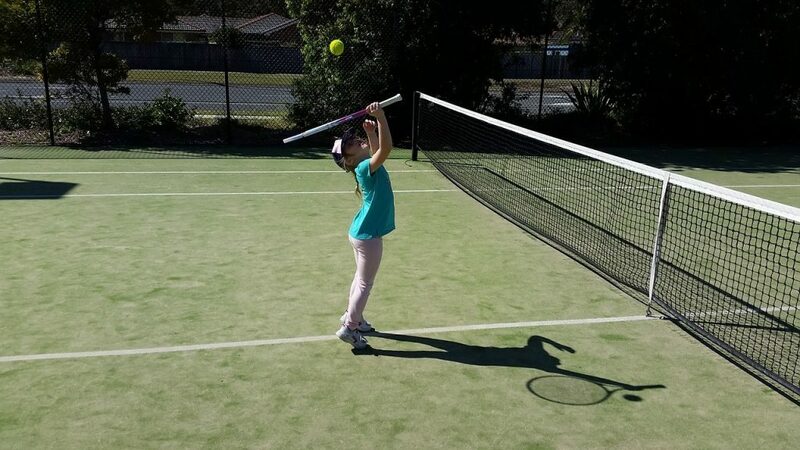 Trains: hand to eye coordination, forehand and backhand, racquet grip, basic court movement. Once a kid has got used to the basic forehand/backhand technique, you’ll want to teach them a) court movement and b) hitting the ball over the net. Set up two teams (you can play one versus one if you like) and have them each form a queue beginning on opposite ends of the baseline. For younger kids, you might want to bring them a bit closer to the net – use the service line rather than the baseline if necessary. Feed a ball into the first player in line, making them move a little bit to get it if necessary. If they make a legal return, they can go to the back of the queue. However, if they miss, have them leave the line and sit out on the side of the court. After feeding a ball to the first line, play a soft shot into the first kid in the other line and continue alternating. Whichever group loses all their players first loses the game. Once it’s over, get the teams to swap sides so that the kids can practice shooting from both sides of the court. It’s crucial to teach your kids to serve properly from a young age so that they get the hang of the technique as soon as possible. If they’ve already got used to the overhead method, you can use our drill designed for adult players. When they’re first learning though, make it really easy for them. Simply get them to hit from the service line instead of the baseline and make the target the entirety of the opposite service box. Focus on the basic technique rather than accuracy at this stage. Once they get the hang of it, consider putting them on the baseline and/or introducing smaller targets inside the service square like empty ball cans or bins. Hopefully this article was helpful! If you have any questions about any of these drills, don’t hesitate to ask us in the comments below.